Luxurious, spacious rooms, a wonderful warm host and a generous, delicious breakfast. What more could you want? 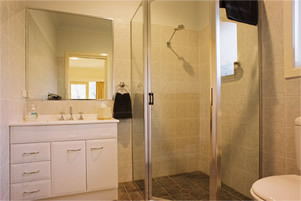 Leloma is exceedingly exclusive with only 2 rooms offered. 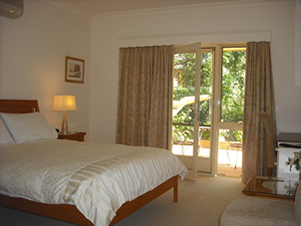 This means that the rooms are just that bit bigger, more spacious, light and airy. Both rooms have private ensuites with modern features, tea and coffee making facilities, a bar fridge, and for your comfort, reverse cycle air conditioning. The position of the rooms at the back of the house, together with the private access ensures your independence and peace. 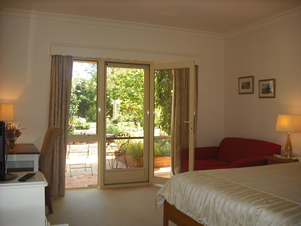 Each room also has it's own 3-piece setting on the verandah where you can relax - perhaps with a cuppa and enjoy the back gardens. For your entertainment there is a TV and DVD player in each room with a small DVD library, and for those who have to work, desk and wireless broadband access is available. In addition, the breakfast / sitting room has a TV and microwave for the use of guests and laundry facilities are available on request.